The last thing you want to happen before the end of summer is a breakdown of your air conditioner. In many cases, an A/C malfunction can be prevented if you know the right things to look out for. Even if you can’t ‘feel’ an issue, an odd sound coming from your air conditioner could be a big issue. Whether it be a ‘bang’, ‘clank’ or ‘click’ noise, it is a sign that something is wrong that could potentially be hard on your A/C and your wallet. On a hot day, some moisture on your outdoor line set is normal; however, you should be on the look out if that condensation starts to build up, especially in the form of ice. There could be an issue of blocked air flow or a refrigerant leak, which will definitely impair the operation of your system. 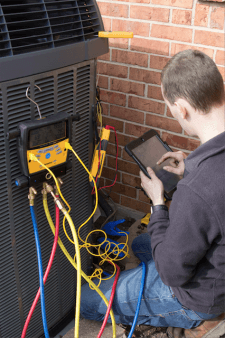 If you see a drastic spike in your electric bill, but the weather outside wouldn't have warranted it, there may be any issue with the operation of your air conditioner. Check the furnace filter first, but if that doesn't seem to make a difference, you may need a repair. The best way to keep your bills down is to perform seasonal maintenance on both your A/C and furnace. Noticing a lack of forceful air coming from your vents? This is not normal, and there could be a number of reasons why it is happening, such as a dirty furnace filter, clogged drain line, or faulty ductwork. By paying attention to these, you have a good chance of staying ahead of a breakdown, even this late in the year. At first sight of trouble, be sure to call a professional HVAC service provider to come and properly diagnose the situation. Schedule a service call with our team in Dayton, Columbus or Cincinnati today!